Last week and this week mark in Taizé the beginning of a beautiful summer. Many young people come to pray, to search for a source for their lives. We, the brothers, with the sisters and volunteers who spend time on the hill, are happy to welcome you. You have seen in the proposals made for 2017 that, with all those who succeed each other here week after week, we would like to open new paths of hope, around us and in the world. It is true that when we listen to the news, we see how difficult the situation is in many places. We live in a world where many know despair. These include violence, wars, terrorist attacks, natural disasters such as a recent fire in Portugal, or drought in Africa. We also pray often for those suffering from famine, and we see that the gap between the rich and the poor in our societies is constantly growing. All next week we will hold a meeting here to reflect on the issue of migration. It is meant particularly for young people between the ages of 18 and 35 who have an interest in welcoming migrants, refugees and exiles. How can we help solidarity to grow with those who are forced to leave their land? This is one of the serious questions of our time. In the context I have just been talking about, in the face of all these burdens, I sometimes wonder how to move forward. Where can we find a source of hope that never runs dry? Where can we find a source of hope if not first of all in the tenderness, in the mercy of God for every human being. We receive God’s mercy as a free gift because it constitutes God’s very identity: God is love. That is why fixing our eyes on the cross and the resurrection of Christ remains so important, and even vital. For my part, I sometimes refer to Peter when he said to Christ in the Gospel: "Where else would we go but to you, Christ? You have the words of eternal life." Yes, through Christ God has communicated his love irreversibly, to all humankind. Seeking to open paths of hope in our world, we want first and foremost to place all our hope in Christ and to find in him the joy of living. This hope in Christ, this hope in the love of God, I often find through personal encounters. I remember a visit that, with one of my brothers, we made a few months ago in a difficult neighborhood of Toulouse, in the south of France. It was a very problematic area of the city but we discovered people who foster hope around them through the simple way they live their lives. I also remember my visit to Syria a year and a half ago. I spent Christmas in Homs, that half-destroyed city. At first glance one can have the impression that there is no hope. But I found a priest and young people who gathered children to celebrate Christmas. Very simply they succeeded in communicating hope to these children. All of you can discover around you such people who radiate light, and, led forward by these people, you can become witnesses of hope for others. Witnesses of hope are what we would like to be—we too, the brothers, humbly, by the gift of our lives. And we are glad that on Saturday, a new brother will enter with us on this road. During the Saturday evening prayer, he will receive the white prayer vestment of the community. His name is Marnix. He comes from the Netherlands. He was first one of the volunteers and is now preparing to commit his entire life to follow Christ in our community. Soon, Emmanuelle will greet all the peoples who are present this week on the hill and flowers will be given to them. 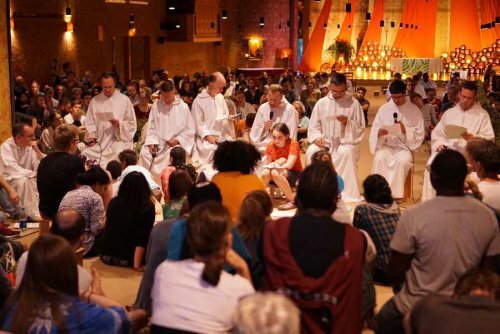 But there are not only young people who come to Taizé; there are also church leaders. I would like to welcome a few of them today. This entire week we have been rejoicing with the young Poles to have Archbishop Polak in our midst. He is Bishop of Gniezno and is the Primate of Poland. He was not afraid to make the long journey with the young people on the bus. With him we have been speaking in particular about the situation of the young people of his country, that country very dearly loved in Taizé. Tomorrow one of the close collaborators of Pope Francis will come, Cardinal Baldisseri. He is responsible for the synods of bishops that take place in Rome. The next synod, in a year, will be devoted to the topic of youth, faith, and vocational discernment. To prepare this, a questionnaire was prepared for all young people, not just Catholics, who want to answer it. You can find it on the internet. We will be reflecting on this throughout the summer. The Cardinal will preside the celebration of the Eucharist on Sunday. On Sunday, we are waiting for another collaborator of Pope Francis. He is a Jesuit in charge of all matters relating to the reception of migrants. He’s going to help us think about this issue during the next week’s meeting that I spoke about. I should also mention the many Orthodox priests and Protestant pastors who come throughout the summer, for example the pastors of Riga who were there last week. Tonight I greet Bishop Jonathan, the Anglican Bishop of Southampton. On Sunday morning the Anglican Archbishop Sentamu will arrive from England; he is the Archbishop of York. He too will make the bus trip with the young people from his diocese and spend next week among them. There are flowers for those from Argentina, Chile, Uruguay, Bolivia, Brazil, Colombia, Costa Rica, Nicaragua, Guatemala, Dominican Republic, Puerto Rico, Panama, El Salvador and Mexico. For those from Australia, United States and Canada. For those from Russia, Estonia, Finland, Sweden and Denmark. For those from Lithuania, Poland, Germany, the Netherlands, Belgium, Britain and Ireland. For those from Armenia, Romania, Moldova, Serbia, Bosnia and Herzegovina, Croatia, Slovenia, Greece, Italy, Spain and Portugal. For those from Korea, China, Taiwan, Hong Kong, Philippines, Indonesia, East Timor, Vietnam, Bangladesh, India, Lebanon, Syria, Iraq, and Palestine. For those from Uganda, Kenya, Cameroon, Chad, Sudan, Ethiopia, Nigeria, Togo, Senegal, Egypt and Madagascar.